Believe it or not, your morning beauty routine could be ruining your nails. Every step of a common beauty routine, including taking a shower, styling your hair, and putting on your makeup has the potential to damage and dry out your nails and cuticles. Dry nails and cuticles mean peeling, cracking and breaking nails, according to Dermatologist Dr. Cynthia Bailey. Dry cuticles may even split and cause painful, bleeding hangnails. Gross. And not a pretty part of a killer manicure. If you've been having problems with your nails, chemicals lurking in your favorite products, heat damage from tools and the effects of hot water could be the culprits. Especially if you're not washing off any product residue after applying face or hair care products or neglecting hand and nail moisturization. If the products that make other parts of your body fabulous are making your nails hideous, fear not. The fixes take very little time and effort but offer a pretty significant reward. The most important change you need to make is to identify what product or habit in your routine is causing damage and to protect your nails from future damage. Oh, and to moisturize like your life depends on it! 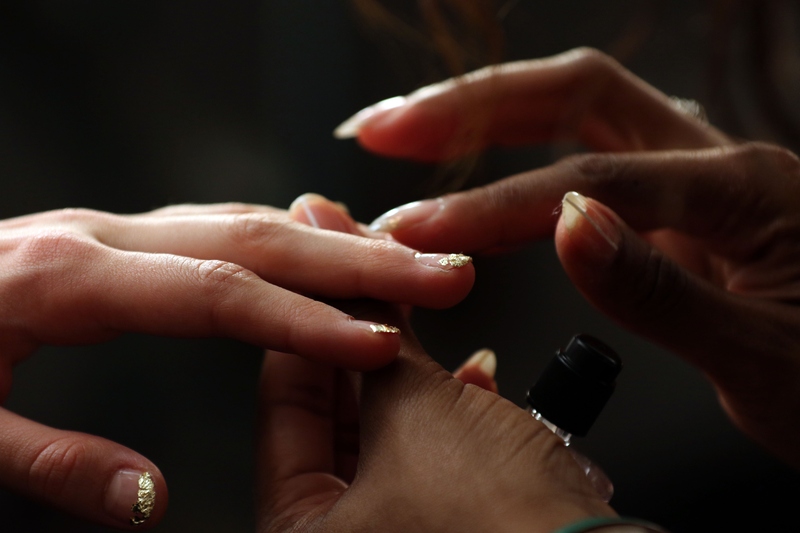 If you're using cosmetics containing alcohol, you may be drying out your nails and cuticles. According to cosmetics watchdogs Truth In Aging, alcohol is used in products to help them penetrate the skin's natural defenses so the products can absorb. There are many derivities of alcohol in beauty products, the site points out, but some types are worse for your skin than others.The nasty ones have low molecular weights. These include ethanol, denatured alcohol, ethyl alcohol, methanol, benzyl alcohol, isopropyl alcohol, and sd alcohol, which not only can be extremely drying and irritating to skin, but may be cytotoxic. A popular emulsifier in hair and skin care products is Diethanolamine (DEA), which can also dry out your skin, according to Truth in Aging. These products can also contain one or more drying color, fragrance or texture additives. Skin cleaners and anti-aging serums may also contain alcohol. Look for products that contain non-drying alcohols such as cetyl alcohol, stearyl alcohol or cetearyl alcohol. These can still cause skin irritation, but are less likely to do so, according to Truth in Aging. Hot water causes the nail bed to expand, according to Cosmopolitan. This expansion causes your nails to lose water and oils essential for strength and flexibility. The downside to showering with polish on is that this expansion will also likely cause your polish to chip or peel. Still, better to have chipped polish than chipped nails. When in doubt, apply a few layers of base coat before you shower, and save completing your manicure until afterward. In case you haven't caught on yet, hydration is absolutely key to healthy nails. That means your nails and cuticles need regular moisturizing. Apply a cuticle oil a few times per day, according to Cosmopolitan. Use lotion or apply cuticle oil after contact with water, such as hand washing and showering. Prevention recommended applying lotion throughout the day, not just in the morning or at night. Using your hands as a beauty tool is a recipe for nail heartbreak. Besides exposing your nails and cuticles to drying chemicals, you also get cosmetics under the nails that often must be scrubbed or scraped out. At the very least, applying beauty products with your hands will require you to wash your hands, which can strip nails of natural oils. If you use your nails to open products or peel off labels, you risk chipping or breaking them, according to Sally Beauty. Pointing your blow dryer at your nails. Get your nails too close to your curling iron rod. Run your fingers through just-straightened (still hot) hair. If these are regular hobbies of yours, they could be to blame for your damaged nails. Getting too close to your hair styling tools can cause burns or can dry out your nail plate, which makes your nails brittle. Just because your nails feel harder than your skin doesn't mean they can tolerate abuse. Treat them as gently as you would treat the skin on your face and they'll be long, strong and flexible in a coupe of weeks.